Shooting a film over a nine month period is exhausting. Even in the long breaks between some shoot day you’re working on the film or working on when you can work on the film. That you have the long breaks between filming is exhausting. It feels like it’s never going to be done. There’s always just one more thing. This was the case with our last two shoot days. Post Production started after the second day of shooting in November 2014. I put together a rough cut of the scenes from the offices. I sent that rough around to cast and crew before we picked up shooting again in January 2015 as a motivational “look at the cool stuff we’ve done already!” By September 2015 we had a rough cut of most, if not all of what was shot. In reviewing the rough cut producer Carolyn Maher and I agreed that we needed to get some pickup shots of exteriors and some shots to establish some of our locations. By agreed I mean that Carolyn suggested this and I was grouchy about it because I “didn’t wanna” and I just wanted to be done with shooting, but Carolyn was right and so we made a plan. I did some scouting around Brooklyn. I tried to keep it simple and accessible from my apartment. On September 20th, about a month after wrapping principal photography, Carolyn, Peter Westervelt, Sarah Schoofs, and myself headed out to shoot some pickups and establishing shots. Conveniently, we got weather similar enough to our earlier exterior shoot days. We got shots of Sarah walking through Brooklyn, some of her on the subway, and various building shots. Some made it into the final film. Others did not, but it gave us options we didn’t previously have for connecting certain scenes. After our pick up day I worked on integrating the shots into the film and we settled on shooting the Wotan Skald Lager beer commercials. I’d been toying with an idea since we’d shot in The Creek and The Cave in May. We’d shoot a couple of commercials with a silly version of Wotan/Odin as the beer’s mascot encouraging people to drink Wotan Skald Lager instead of some inferior beverage. In order to get as much as possible out of the shoot we also decided to shoot these commercials in 3 languages: English, German, and Spanish. We didn’t know exactly how we’d use the beer commercials. Likely they would go on some screens while people were watching TV in the film. At the very least most of them would end up as a promotional tool for the film. Casting ended up being one of the toughest parts for the Wotan commercials. Jeff Davis was a friend of director of photography Peter Westervelt and he was who I wanted for Wotan from early on. I’d met Jeff a few times. He’s a comedic actor and a fellow director. He’s very funny and I just thought he would make a fun Wotan. Beyond Jeff, it got tough to find a cast. I put out my usual calls but didn’t get a strong response. It made sense. I had tapped most of the people I already knew for other parts of the film. In addition to Wotan, I needed two men and two women to be “educated” by Wotan on the right beer to drink. Ultimately, I turned to two friends and fellow filmmakers Myles Austin and Lars Fuchs to play the men. I’d cast one woman and was having trouble finding a second and then had a thought that it might be fun to bring Ginny Leise, who had played the “final girl” type lead in our Beneath the Black Moon film-within-a-film over the summer. Ginny was down for it so we had our cast. The morning of the shoot we lost the other woman. She had a sudden family emergency and had to drop off the shoot. So, we went from the balanced beer lovers to just shooting with our Wotan, Jeff, and two male and one female beer lover. As with other issues that came up through shooting, you just have to adapt to work with what you have available. The bar we shot in for the Wotan commercials was inexpensive, but also our communications about the kind of shoot we were doing and what we’d need weren’t well understood. We were to be shooting before they opened but it was unclear to the person in charge that we would need a whole section more or less to ourselves to do that. By about halfway into our short shoot we had some annoyed staff walking around us to do their jobs. It hadn’t actually been communicated to them at all, as I recall, that we’d be there and working. Mercifully, most of our shots that needed dialogue were shot early in the day when we were still pretty much alone. We only had a couple more at the point where the space was starting to get difficult to shoot in. The majority of the audio needed was something planned for a voiceover as it was. The voiceover session with Jeff happened immediately after we wrapped our bar shoot for the commercials. We setup a little sound booth at a table at the One Glass Video office as we returned the gear we were borrowing for the shoot and recorded all of Jeff’s lines for the commercials, including the parts that we had already shot at the bar, just in case there was an issue with that audio. Including having Jeff re-record all of his lines, we also had a bit of fun with Jeff doing the lines in different voices or with different rhythms. This may be the sort of thing that will only ever amuse me personally, but the intent was to have another element for the film’s promotion when the time came. That is ultimately something we kept in mind with so many little bits of the film. As I said, we weren’t a hundred percent sure how the beer commercials would play into the film, but they could be used as a hook to potentially get interest in the film. Related content that might pique some interest. This is the same with shooting more of Beneath the Black Moon than we knew we needed for the film. This is the same with shooting lots of behind-the-scenes photos as we were working and encouraging cast and crew to do the same. This is what this blog post series is all about. It’s not enough to make the film, you’ve got to be mindful of the many roads that people may come to the film and try to build as many entry points for interest as you can. With everything shot, a rough cut in place, and some a little more material to work with it was time to get serious about post production and completing the film. It was late October 2015, eleven months after we started production. Post Production would take more than two years to complete. 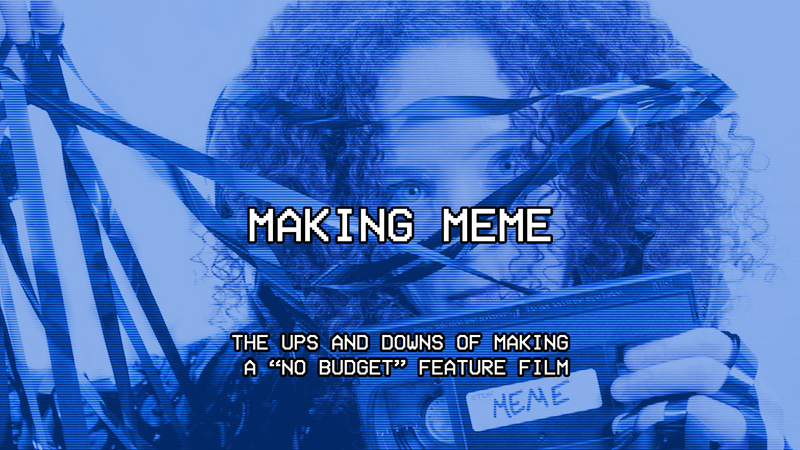 In the next installment we’ll review the Post Production process that lead to the first rough cut of the film and the approach we started with with before rethinking the movie.